A 10-year-old boy has been cited after allegedly damaging the "Rising Eagle” sculpture in Pioneer Park in Bismarck, North Dakota. 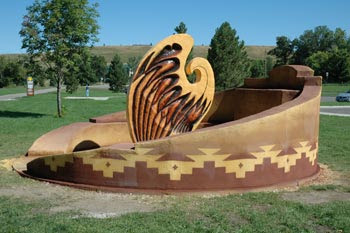 The boy and his family were visiting the park when his foot apparently fell through it, according to police officers. The damage was reported to be minor and easy to fix. The sculpture was badly damaged by vandals last year. Students at United Tribes Technical College worked to restore it.